Sorry I'm a little late getting this blog post up. Okay, like three years. 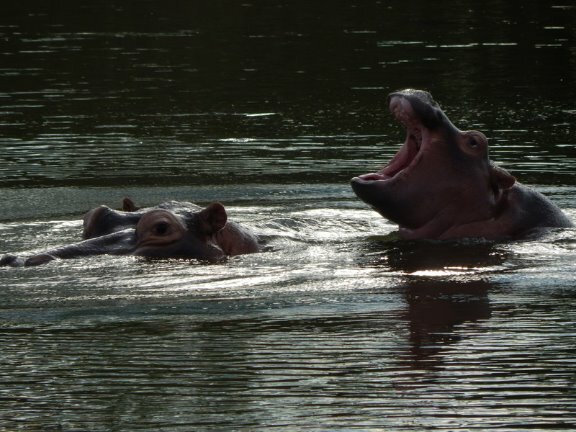 To research The Devil's Horn, I traveled to S. Africa for two months. 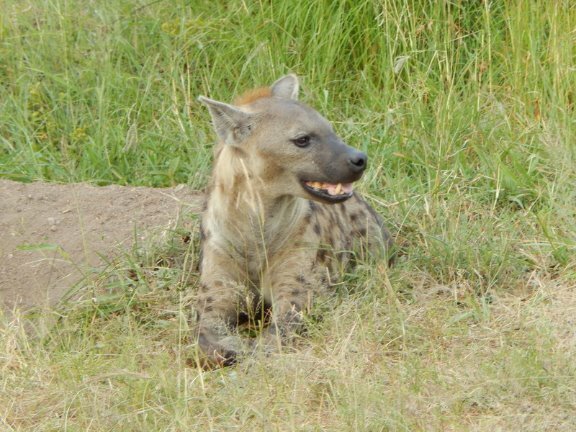 While there, I spent a lot of time on the Kruger National Game Preserve. I was very fortunate to be able to learn a great deal from the Rangers who put their lives on the line to keep the park safe for all of its animals. 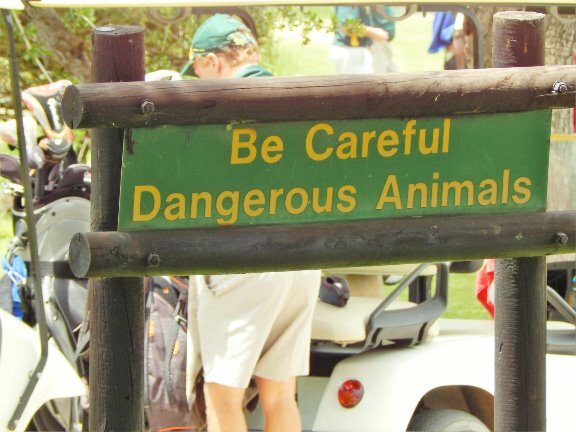 I also got to play golf on the seventh most dangerous golf course in the world, since there are no fences around it to keep the animals out. Here are some photos from the trip. 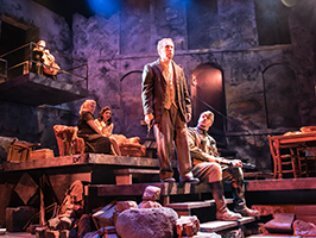 On my birthday, 2017, my script adapted from my novel The End Of War had in its world premiere in Richmond Virginia, with Virginia Repertory Theatre. 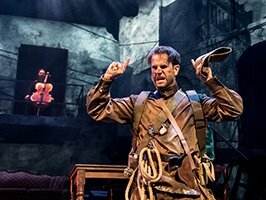 The production was spectacular in every component, acting, design, stage craft, and featured a remarkable multimedia backdrop. 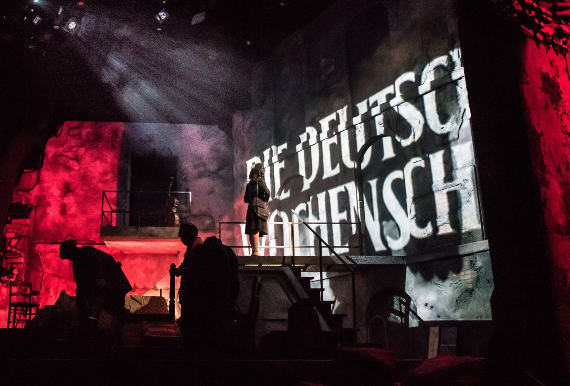 Here are some visuals from the play. 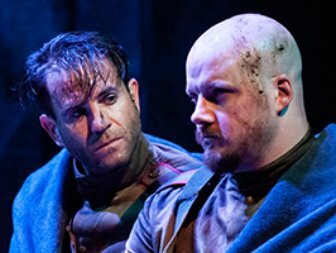 And with luck, in the not too distant future, this might be onstage at a theater near you. After ten published novels, I decided to try my hand at a serial approach to books. And I wanted a contemporary setting, to leave history behind for a little while. I fell in love with a Special Ops branch of the US Air Force, known as the PJs, for pararescue jumpers. These are among the most highly trained warriors in any nations' military, except their mission is not CSAD (Combat Search and Destroy); the PJs are CSAR (Combat Search and Rescue). Their motto: That Others May Live. The PJs train to operate in every terrain on Earth, because that's where America's military and our allies work. They specialize in infiltration and evacuation, under any circumstances, from severe weather to heavy combat. I've been fortunate to befriend several PJs and Combat Rescue Officers (CROs) who help keep me factual and on target. In fact, a few of those guys will take credit for my plots. I'm not saying they don't deserve it. I'm just plain not saying. For The Devil's Waters, I visited Gbriski Air Base on Long Island twice, and embedded for two weeks in Djibouti, at Camp Lemonnier with the PJ unit there. 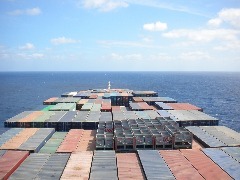 Because the book takes place on a giant cargo freight in Somali pirate-infested waters, I booked passage on a ship from Malta to Dubai, another two weeks. Onboard, I spent every day crawling around the bowels of the freighter with the crew and by myself, and nights at the captain's table or in his quarters debating with him and his chief engineer over the best ways to blow up their ship. Great guys, a once in a lifetime experience. 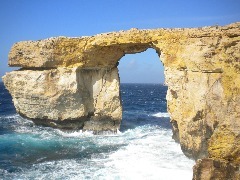 The Blue Window, on Gozo, the small island off Malta. To sense the scale, see the small person in the upper right edge of the photo. 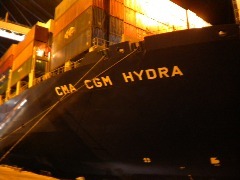 CMA CGM Hydra. This was my first look at my home for two weerks and three thousand ocean miles. She is the third largest freighter in the world. 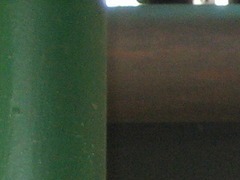 A stroll around the deck was a quarter mile. 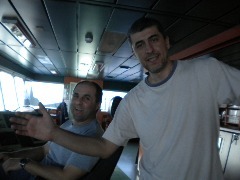 Croatian Captain Dado, Rumanian Chief Engineer Razvan. Dear friends, great guys, patient mentors. 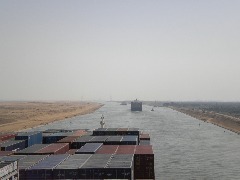 In the narrow Suez Canal, heading south. 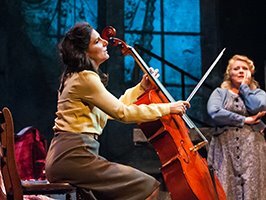 This based-in-fact story about the liberation of a Philippino internment camp and the love story between a young Filipina Comfort Woman and an American prisoner near the end of WWII took me to Manila, Luzon, Corregidor, and Australia. The freeing of the Los Banos camp by U.S. Marines on the day the Japanese had it scheduled for annihilation was one of the biggest success stories of the Pacific War, but it got lost in the news cycle of the day behind the iconic raising of the American flag over Mt. Suribachi on Iwo Jima. I love this book. 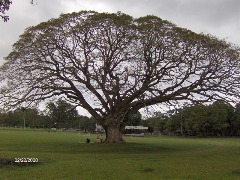 A massive, old bilbao tree on the grounds of what was once the internment camp of Los Banos, on what is today a college campus. Use your imagination, and see hundreds of tents and hovels built on these grounds, lived in my two thousand starving and abused Americans and Brits. 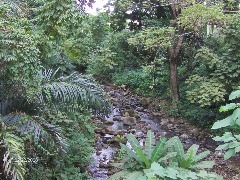 This ravine that ran just outside the fence of the Los Banos camp. 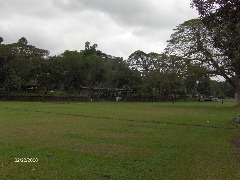 Internees planned the rescue with the local guerillas by slipping through the camp's barbed wires to communicate in this ravine, sneaking into the town for meetings, as well as smuggling in food and radios. 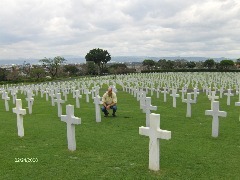 At the magnicifent and somber U.S. cemetry in Manila, where U.S. servicemen and Filipino fighters alike are buried. 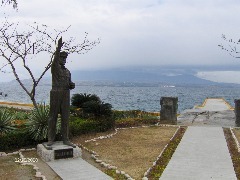 Gen. MacArthur stood on this spot on Correidor and said, "I shall return." Bataan lies in the background. 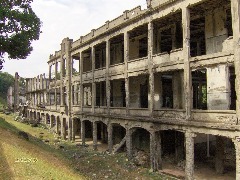 Former army barracks on Corregidor. 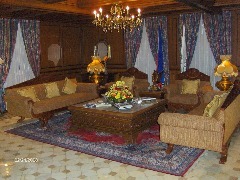 MacArthur's living room at the Hotel Manila (where I sat by the pool and listened to Earth Wind & Fire play live). 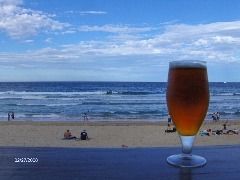 The best photo I've ever taken: a Fosters on Manly Beach, Sydney, after an interminable trip to get there. My dear friend Tom Donnelly, Aussie vet of three tours of Viet Nam in the early 60's, with the coolest rat tail ever. 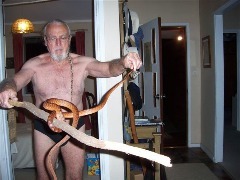 He holds the poisonous brown snake he pulled out of the rafters of the guest room at his Narabeen house three days after I left. The snake would have had to bite me just to get out from underneath me, because I would have fainted on it. This novel took me to Cuba for six weeks. Two of my good and trusted friends, Mike and Daniel, went with me, and we had some adventures best left between the three of us. 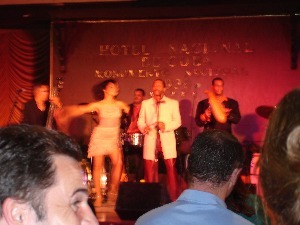 I will relate a few items, though: 1) I smoked five cigars a day, fresh from the Montecristo factory; 2) one warm eve at our grand Havana Hotel, after watching a wonderful performance by the famous Buena Vista Social Club, Danile ordered bottles of rum for the whole band, drank one himself, then went to bed before paying the bill, and Mike and I signed it to his room - he still doesn't know; and 3) Mike and I scuba dived in the Bay of Pigs. A great and memorable trip, and the sort of locale a writer cannot imagine but must see firsthand. Mike, Dan and I drinking with the BVSC. I think I bought this round. It looks early in the evening. 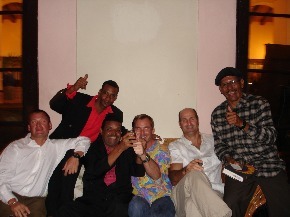 The world's greatest performers of Afro-Cuban jazz. 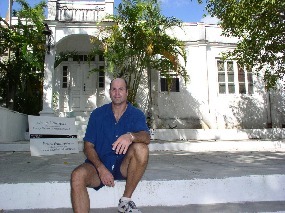 Outside Finca Viga, Hemingway's Havana estate. A pilgrimage for any writer. Jogging along the Malacon. 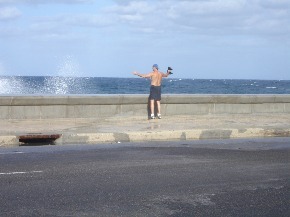 The waves strike the seawall and go twenty feet in the air. 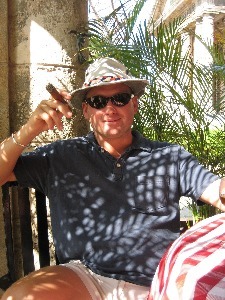 My boy, Captain Mike Beach, chillin' Havana style. My other boy Mac Daddy, in Papa's favorite bar, La Floridita. Papa looks to be a few ahead of us. 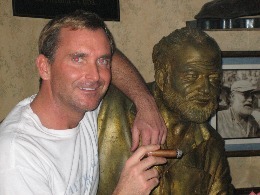 ​The Cuba team, standing next to Pilar, Hemingway's famed fishing boat.